Meet Handsome Dan (I like to call him Handy). He’s one of my favorite long-distance dog crushes. 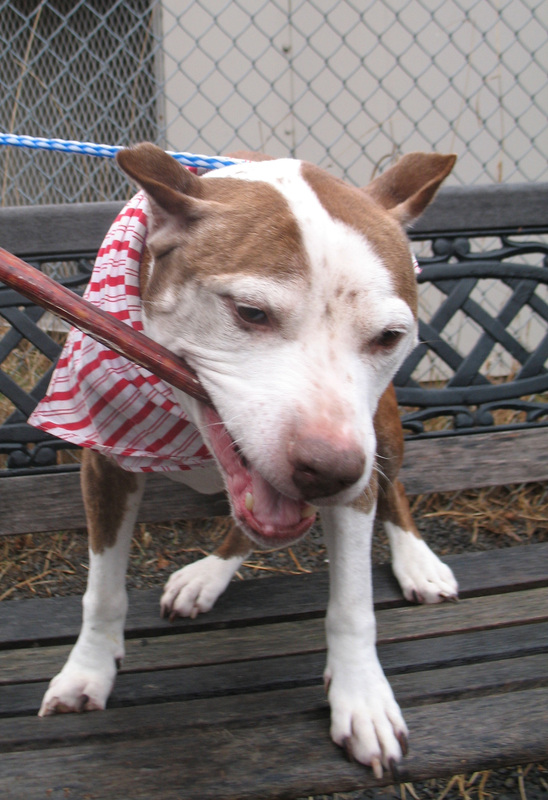 Handy and his fabulous family held a Bully Stick Drive at the end of 2011. Their goal was to collect enough treats so that every dog in their local animal shelter in Rhode Island would have something special to snack on this Christmas. 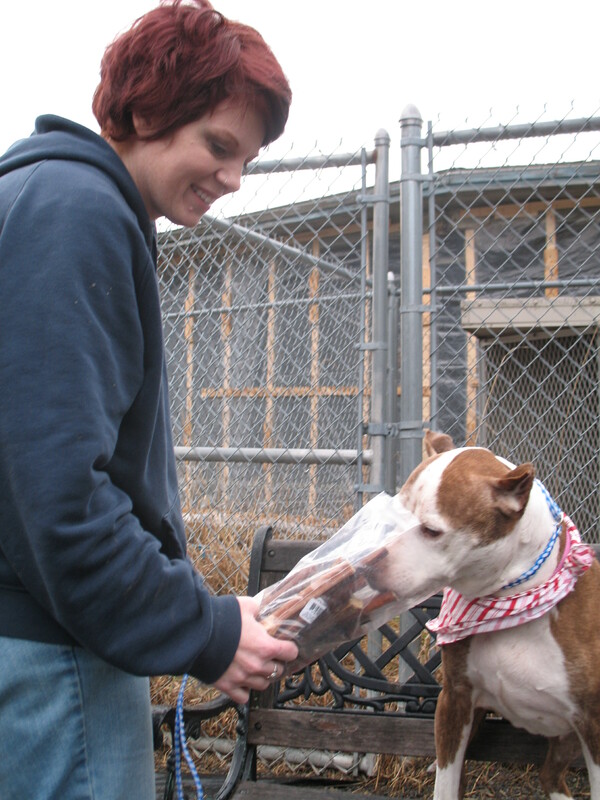 Handy’s mom, Heather, had her fingers crossed that they’d receive 100+ bully sticks. But people are generous. Really generous. They received 600+ bully sticks. Heather and Handy knew right away that they wanted to share the loot and so, after the dogs of Rhode Island were all taken care of, the remaining bully sticks were shipped across the country. Some went to Animal Farm Foundation in NY. A lot went to Philly and the dogs at the PSPCA. A whole bunch went to Austin, Texas. And just in time for New Year’s Eve, a package from Handy arrived at my door in Maine. As the shelter was closing for the holiday, and the dogs were returning from their final New Year’s Eve walk in the cold rain, I arrived at the Animal Refuge League with Handy’s special care package. The very first recipient, was the beautiful 11-year-old elderbull, Mariah, who gave the bully sticks a proper inspection (right). It was the very best way to finish out the year: together with my friend Jen, who works so hard and so fearlessly as the shelter’s kennel manager, visiting each and every dog, delivering a little bit of yummy love. Thank you to everyone who donated to Handsome Dan – your generosity was felt across the country this holiday season. And thank you to Handy and Heather for shipping a little box of heaven up here for Maine’s homeless dogs. It was a gift to me to give out your donation. If you’re feeling inspired, there are never enough bully sticks or Kongs or soft blankets at shelters. Hold a drive, raid your closet, go on a shopping spree at a pet store, then spread a little slice of love among the homeless dogs in your town. You won’t regret it. ← Happy Holidays from the Dog Walker! Awesome 🙂 Gotta love when the love is shared! That is so cool! Handsome Dan is so generous! Thank you so much for your volunteer work and the efforts you’ve made to make the shelter dogs’ lives a little less lonely. Having worked in a shelter and as someone who fosters upwards of a dozen dogs per year, I know that every little random act of kindness counts.